Our princess Madelyn turned 4 years old on June 14th. After 2 weeks of on and off fevers that didn't seem to go away, an ultrasound revealed that Maddie had a mass in her abdomen. On Wednesday, June 28, our lives completely changed; doctors told us that the mass was a malignant tumor. On Friday, June 30, Maddie went into surgery; unfortunately, the doctors decided that it was not safe to remove the entire tumor, so they took parts of it for biopsy. That biopsy revealed that she has a rare kidney tumor (cancer) that is aggressive. Tests also showed that she has small nodules in her lungs. Maddie has had multiple chemotherapy sessions thus far. Her treatment plan (chemotherapy, additional surgery, and radiation) is estimated to be around 6-9 months. In that time, she'll be in and out of the clinic and hospital. Maddie has such a kind heart and she is full of wit, sass, curiosity, and most of all, she gives us a daily dose of her addictive laughter and smiles that show her dimple! 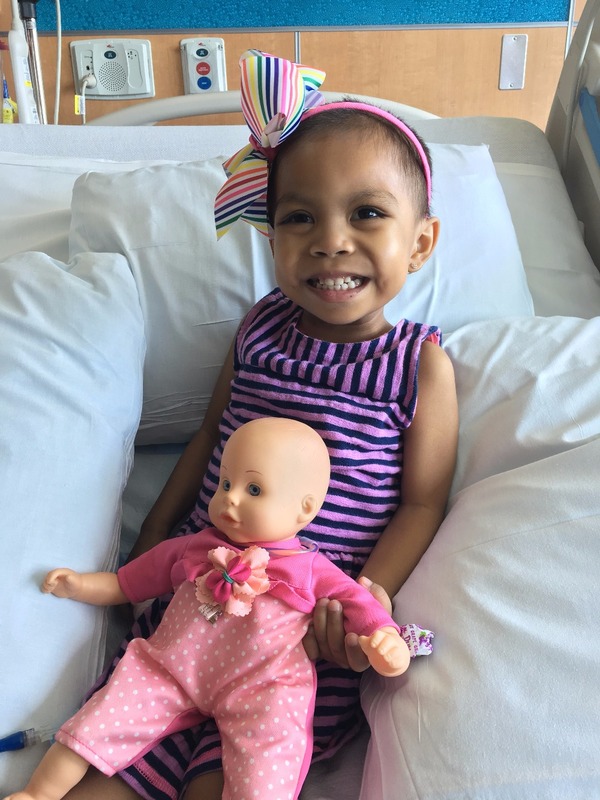 Maddie is amazingly strong, brave, and her spirits are high; she is strong-willed and a lot of her personality comes out during our clinic and hospital stays, often making us and the hospital staff laugh! She is a fighter and is the strongest 4 year old we know; Wonder Woman got nothing on our princess! There are countless unknowns in our journey; please do not feel obligated to contribute as your continued thoughts and prayers are already more than enough. Together we fight and we pray. Our last update was in September 2018; trust us when we say we think of all of you every day and the impact you have made in our lives. Time is flying and we are treasuring every moment! -Maddie and Nixon attended a regular season Redskins game; there was lots of cheering in their #91 Kerrigan jerseys! Thank you to the Redskins Charitable Foundation for hosting us! -Maddie and Nixon have been wanting to go to a Caps game, so Mommy and Daddy took them to a pre-season game (where there'd likely be less profanity in the crowd) and had so much fun! However, Make-A-Wish Mid-Atlantic topped the experience in November and invited us to be a part of #CapsFightCancer: we attended a game where the names of the children invited (fighting or have fought) were projected on the ice and Maddie's very first time ice skating was with the incredible Braden Holtby!! MAW and the Caps players were so thoughtful and it was such an amazing experience for all of us! -Maddie has continued taking gymnastics lessons until recently; she stopped gymnastics in February to start playing soccer (twice a week); Nixon stopped taking Ninja classes until recently and will also go back to playing soccer in April! -Maddie finally got her decayed teeth removed. 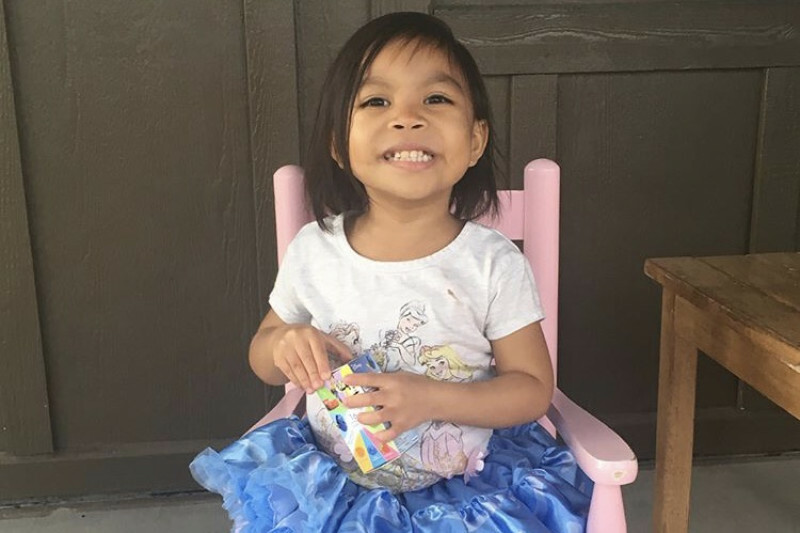 Originally, we thought she was getting 5-6 baby teeth removed, but once the oral surgeon and dentist went in, they realized she had more bad teeth than expected. While Maddie was under anesthesia, Mommy and Daddy decided that all decayed teeth should be removed (who cares about aesthetic reasons, we wanted to eliminate all possible reasons for her to get an infection or harbor bacteria); Maddie had a total of 11 teeth removed (all of the top front and most of the back teeth on both sides; she has 1 top tooth on the right and 1 top tooth on the left, and her bottom front are still there). When we left the dental office, in typical Maddie fashion, she didn’t care so much about the missing teeth, but she was annoyed that she had gauze in her mouth. Since then, Maddie has gotten used to chewing with her gums and the teeth she has left! She’s gained more weight because (as the dentist said) food tastes better now! -On December 14th, Maddie had her scans; no big deal for Maddie since she just thinks of it as a day of “pictures.” Thank God, Maddie’s chest X-ray and abdominal and pelvic ultrasound were clear; Maddie remains NED (no evidence of disease) 9 months post-treatment! -Thanksgiving, Christmas, and New Year’s celebrations were all amazing because we were home and got to spend it with our family and friends! -In January, as the government shutdown occurred, we were asked to provide a testimonial of the importance of blood donation (often, blood drives occur at government sites and the shutdown affected the available inventory). 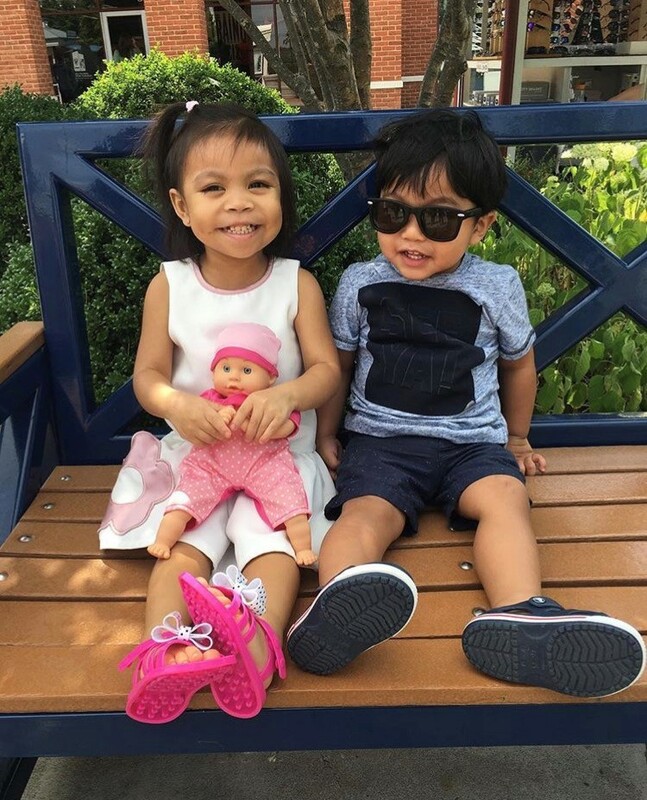 Mommy and Daddy were interviewed and took part in a video message (organized by INOVA Blood Donor Services and WUSA9) to stress the importance of blood donation! Endless thanks to all those who donate blood products so that others could have a chance to thrive! 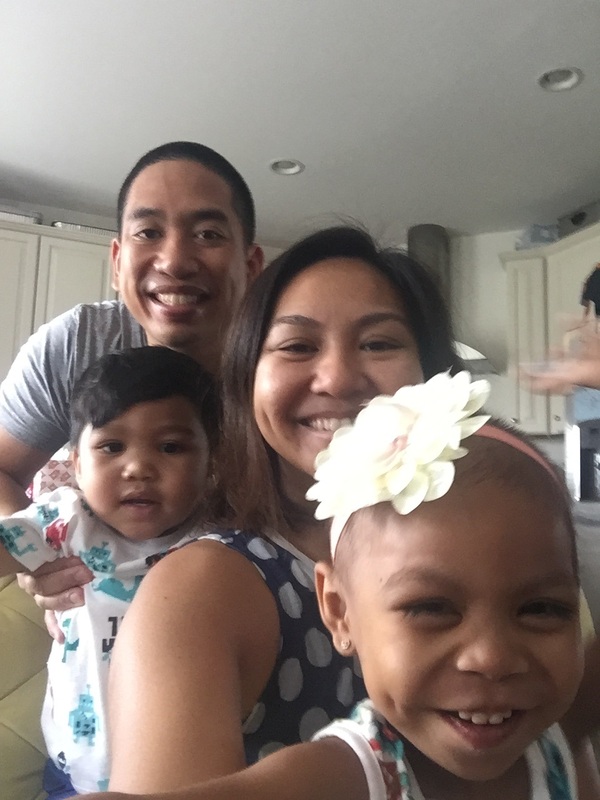 We are so grateful and committed to this cause that Daddy has switched career industries and will be taking on a position with the INOVA Blood Donor Services! On March 13, 2018, Maddie received her very last inpatient chemo medicine. Yes, it has been 1 year (9 rounds of chemo later)! That one year has been a blur and a collection of vivid memories, jam-packed with the entire human spectrum of emotions, all at the same time; God is good to us and we are grateful for every day! On March 18, 2019, Maddie had her quarterly scans (1 year since treatment). Let’s just say this was the most nerve-wracking for Mommy. We pray and we stay positive! 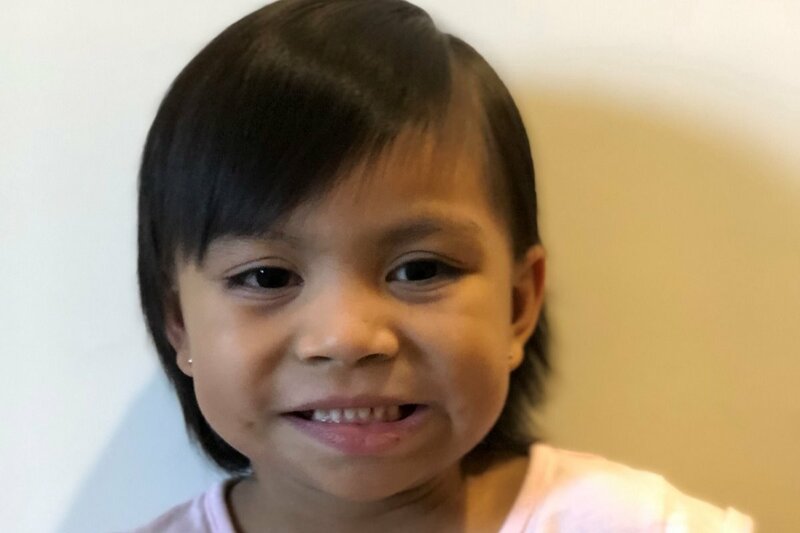 On March 19, 2019 we went to clinic to get the results; Thank you God – despite having the flu just a few days before, Maddie’s chest X-ray and abdominal and pelvic ultrasound were clear; Maddie remains NED! Maddie's hair has grown in beautifully (in case you're wondering, it is the same texture and color as it originally was)! Maddie continues to love Kindergarten ….. Mommy and Daddy (and we’re sure all of you are too) are excited and astonished that, God-willing, this brave little girl will be in first grade in a few months!! We’ll leave you now to enjoy every moment of your todays and tomorrows! You will remain in our thoughts and prayers and we will be sure to update you again! We send you love and thanks, as always, for the love, support, and prayers. We appreciate you! It has been a busy 2 months since our last update; the great kind of busy because we have the opportunity to be at home, take adventures, and create incredible memories together as a family! 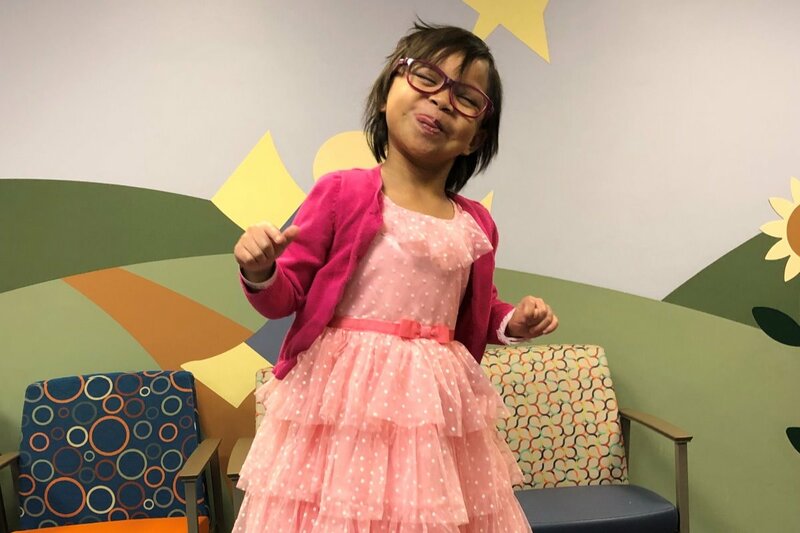 •	Maddie has astigmatism; she picked out her own eyeglasses and we’re thankful she was excited about it and has become accustomed to wearing them. •	8.14.2018 – Maddie had her last port access (for CBC and monthly flush). •	8.15.2018 – Maddie had her port removal surgery (performed by the same surgeon from her other surgeries)! The port was removed without a hitch; thankfully Maddie recovered quickly without the need for pain medication. •	8.23.2018 – Maddie started Kindergarten! She continues to enjoy fun times with her friends, learning how to write, solve math problems and do science experiments, use the promethean board, drawing hearts and flowers, and hopefully reading soon! •	Maddie attended 2 fundraising events in support of children and illnesses: Night of Magic at the hospital hosted by Northwestern Federal Credit Union Foundation and CureFest at the National Mall, DC. •	Mommy and Daddy took Maddie and Nixon to their first Nationals and (pre-season) Redskins games! We hope to also take them to a pre-season Capitals game soon. Make-A-Wish Foundation is one of those organizations that we knew existed, but never really realized the extent of their impact. Well, let us tell you that MAW and its supporters accomplish amazing things to gift “wishes” to children (with life threatening illnesses)! It began with our wish granters (volunteers; ours happened to have been affected by cancer/illness in one way or another) meeting with us and spending time with Maddie to discover her wish. Ultimately, her wish was to “meet Moana, on a boat!” On September 6-11, our family was beyond fortunate to take a trip and create amazing memories at Disney’s Aulani Resort in Hawaii! We are thankful and humbled by all parties involved (MAW http://midatlantic.wish.org/, United, Disney’s Aulani https://www.disneyaulani.com/) for showering us with impeccable hospitality; we truly appreciate you taking Maddie’s wish to a whole new level! Maddie and Nixon’s smiles/laughter, our exciting adventures, and memorable moments are priceless! When we returned from the Hawaii trip, Maddie had her 6-months post treatment scan on September 14: an abdominal ultrasound and chest x-ray. God has graced us once again with His love, protection, and continuous healing with Maddie’s N.E.D. (no evidence of disease) results! Maddie’s clinic checkup also went well, her platelets continue to rise and recover; she is no longer on any medications aside from vitamins; however, we are still working on her eating habits for her to gain some more weight. Every day is truly a gift for us! Thank you for being a part of it! As always, we are grateful for your continued love, support, and prayers! We send you our love and well wishes (until our next update). Maddie was diagnosed with cancer on June 28, 2017 (she had just turned 4 years old). She had her first surgery on June 30th; and soon after (July 6), Maddie had her first round of chemo. It has been one year. •	Visited the Pittsburgh zoo, where we finally met the incredible family (whom we’ve kept in touch with) of a 4-year old princess who is also a survivor of malignant rhabdoid tumor of the kidney (the same diagnosis as Maddie). That little girl has shown no evidence of disease for almost 1 year now! Maddie had her very first CT scan (3 months) after treatment on June 20. Days leading up to it were filled with anxiety and a million emotions for Mommy (some call it “scanxiety”), but thankfully Maddie saw it as just a regular day to take “pictures” of her chest and belly. (If you recall, her Oncologist had mentioned to us that patients diagnosed with this type of tumor have experienced a relapse 1-2 months after finishing treatment.) By God’s grace, Maddie’s scans were clear! Thank you for your continued love, positivity, support, and prayers! Maddie still has a number of appointments she has to go to: monthly clinic visits to check CBC and flush her port, hearing test, annual check-up with her Pediatrician, and now vision exam. Maddie’s hearing hasn’t had any significant changes (yes, there may have been a slight loss during treatment – she doesn’t hear lower tones very well…..but we are thankful it is not getting worse). Her 5-year old check-up with her Pediatrician went fine, however they want her to take a formal vision test. Since our last update and Maddie's end of treatment, she has made 2 trips to the ER for fever, not for low immune system. Maddie is currently on only 1 medication: Periactin, the appetite stimulant. We are continuously working on getting her to eat more to gain more weight (thankfully she's on a slow rise) and weaning her off the medication. Every day that Maddie is able to do activities that kids her age do (without ouchies) and she is happy and healthy, we are grateful! Next week, Maddie will have a consultation with the surgeon (who performed her kidney surgeries and port insertion) to hopefully schedule the removal of her port. Because her scans after treatment showed no evidence of disease, the Oncologist cleared her to get her port removed (outpatient surgery). What does this mean? Without a port, Maddie does not have to go straight to the ER when she gets a 101 degree fever, she would be less susceptible to infections since there will no longer be that direct access to one of her large veins, and because she is no longer getting chemo medicines. Furthermore, we are working to coordinate a date/time that would knock out two birds with one stone: while Maddie is sedated for her port removal, the dental surgeon would subsequently extract or restore some teeth that have decayed during her treatment. What is the importance of getting these teeth fixed? According to the dentist, teeth won’t naturally fall out until a child is 6-7 years old; because of what her body has been through, all involved parties are in agreement that we remove (as much as possible) anything that could lead to an infection anywhere in Maddie’s body. We are truly grateful to you and all the powers above, for being by our side and giving us endless love and support! We hope you are having a wonderful summer and we hope to continue to share great news with you! We hope this message finds you well and that you are enjoying the summer weather! Maddie's clinic check-ups (she's had 2 in April since our last update and 1 a week ago) have been going well, blood counts are stable and she's not needing any transfusions. Amazing how fast hair grows: Maddie's hair on her head is now beyond a peach fuzz, her eyebrows are full, and we're so happy to report that her eyelashes are growing in just as she previously had them: long and thick! We are loving being at home; despite the sibling rivalry, annoyance, and bickering, there are lots of hugs, laughter, and tag-teaming between Maddie and Nixon! Watching them spend time and grow together is incredible! We celebrated Nixon's 3rd birthday earlier this month!! Maddie also started back at her (old) school; she is currently enrolled 3 times a week. 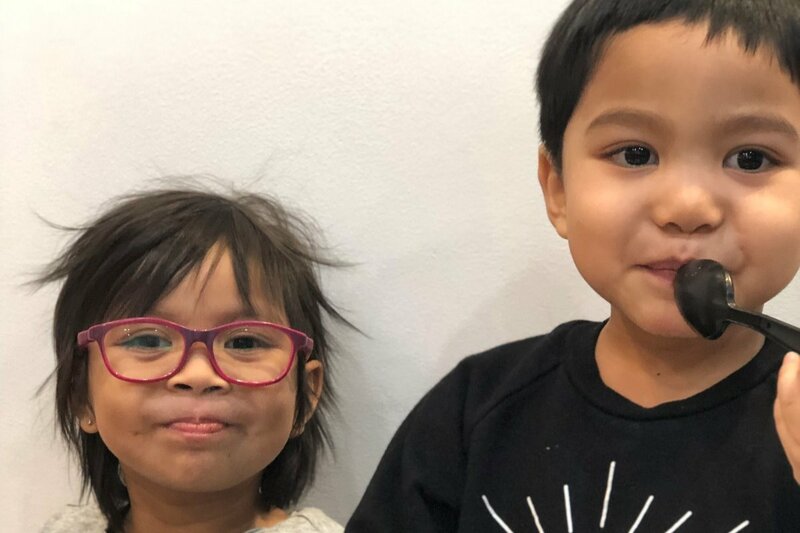 At first we were concerned that the kids would have a lot of questions, but we believe that Hopecam's ( https://www.hopecam.org/) mission to connect Maddie to her school over Skype and her accompanying Nixon to school every now and then helped. Kids are so smart and carefree; they gladly welcomed Maddie back to class! Mommy attended a parent-teacher conference and her teachers constantly tell us that she's doing well; like she hadn't been absent from school at all! Maddie has been very happy to be back at school with her friends, and vice versa; when we drop her off at school, we immediately hear the excitement in her classmates' voices when they squeal: "Maddie's here!" Those kids are so sweet; we are blessed! Maddie has been attending her dance classes, which sadly came to an end yesterday with her Spring Dance Recital! Maddie did a wonderful job, we are so proud of her! We often reflect on our busy/fun times by taking turns discussing our favorite part of the day. Maddie said her favorite part of yesterday was: "being on the stage!" What's coming up in June? -Maddie will be enrolled full time at her school; summer camp will be filled with exciting activities, so we're sure she'd prefer to be at school! -Maddie will get a GFR to monitor her kidney function. -We will be attending the Alex's Army Push-Up Challenge on June 10: http://alexsarmyccf.org/ please join us if you can! -Maddie will have a follow-up appointment to flush out her port (monthly cleaning) and to prepare her for her scans later in the month. -Maddie is turning 5 years old on June 14! As always, thank you for your time, thoughts, love, and prayers! We hope you enjoy the pictures and videos of our Wonder Maddie! We also hope you are well and that the weeks to come (until our next update) are full of joy and blessings! loving being back at school! 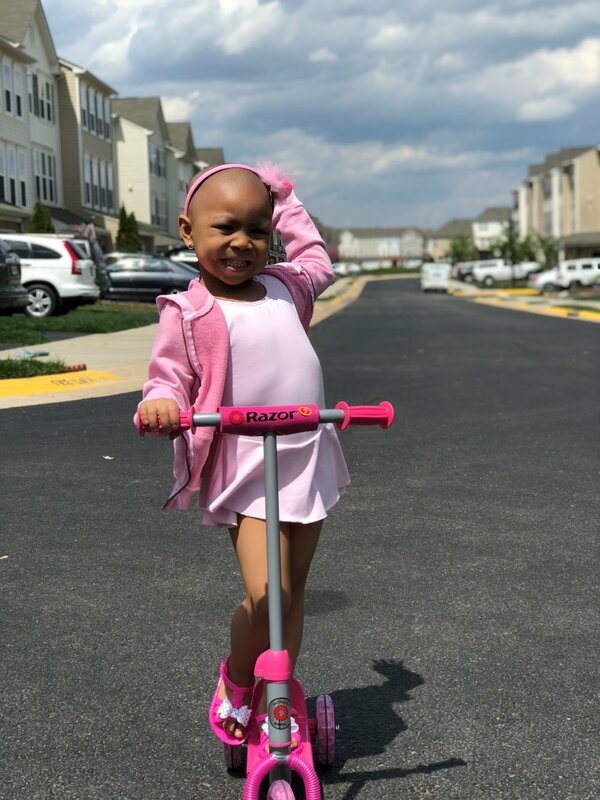 playing outside on her scooter!